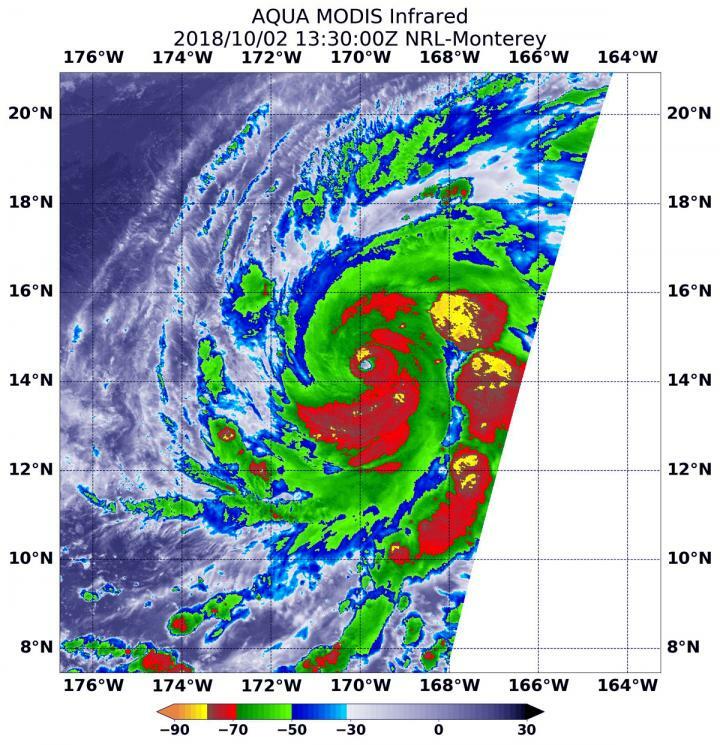 Infrared satellite imagery provides temperature data, and when NASA's Aqua satellite passed over the Central Pacific Ocean, it analyzed Hurricane Walaka. Walaka is a Category 4 Hurricane on the Saffir-Simpson Hurricane Wind Scale. The Moderate Resolution Imaging Spectroradiometer or MODIS instrument aboard Aqua provided that infrared data on Oct. 2 at 9:30 a.m. EDT (1330 UTC) MODIS data showed cloud top temperatures in strongest storms around Walaka's center and in a fragmented band of thunderstorms east of the center of circulation. They were as cold as or colder than minus 70 degrees Fahrenheit (minus 56.6 degrees Celsius). NASA research indicates very cold cloud tops with the potential to generate very heavy rainfall. On Oct. 2, a Hurricane Warning was in effect for the Johnston Atoll and a Hurricane Watch is in effect for Papahanaumokuakea Marine National Monument from Nihoa to French Frigate Shoals to Maro Reef. At 5 a.m. HST/11 a.m. EDT/1500 UTC, the center of Hurricane Walaka was located near latitude 14.7 degrees north and longitude 170.0 degrees west. Walaka is moving toward the north near 10 mph (17 kph). This general motion is expected to continue through Wednesday night with a steady increase in forward speed. On the forecast track, the center of Walaka is expected to pass just to the west of Johnston later today. NOAA's Central Pacific Hurricane Center noted "Maximum sustained winds are near 155 mph (250 kph) with higher gusts. Walaka is a category 4 hurricane on the Saffir-Simpson Hurricane Wind Scale. Little change in intensity is expected through tonight, with rapid weakening expected Wednesday and Wednesday night."